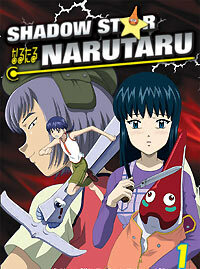 Notes: Based on the manga by Kitou Mohiro, available in the United States as "Shadow Star" from Dark Horse. Tamai Shiina is a somewhat awkward but kind-hearted young girl attempting to live a normal life despite the separation of her parents. On a trip to visit her grandparents, a mysterious entity calls to her and after an unusual sighting she discover the creature, a small starfish creature with the ability to change shape which she names Hoshimaru. Delighted with her new friend, she returns home. However, Shiina is not the only one with an unusual friend, and some of these others are not quite as kind as Shiina. I've noticed more than a few people look at the artwork of the show, the cutesy opening, or the relatively benign relaxed first episode and interpret this as some sort of lighthearted show for young kids. Let me just say right now, that this is not some cutesy show for young children despite what the surface elements might lead you to believe. In France, there was even an issue with them having to stop the dissemination of the manga in some of its later volumes because of some of its content. I had read a bit of the manga so I quickly realized the nature of this show, but if the viewer has any doubts, you'll probably be convinced when the young kids start showing up waxing philosophical about Khmer Rouge-style genocide. While there is a central mystery involving the nature of Hoshimaru and his ilk, most of this show is a bit more focused on certain psychological and sociological issues. We have a number of characters in distressing situations from schoolyard bullying to broken homes, all of them attempting to deal with them in their own way. I should note right here, that Shiina seems to be one of the few remotely psychologically stable characters in this show. Despite her home issues and some of the horrible things she later witnesses, she manages to keep a kind and inclusive heart trying not to let despair overwhelm her like it has so many other characters in this show. Despite a lot of the trouble that is going on around her, she is still determined to try and help others and protect people. I found her an unusually sympathetic character. The various creatures in this show are rather interesting in that they have numerous forms and abilities that seem a reflection of the personality of the human they are linked with. Every time a new creature shows up, you simply don't know what to expect. In a way, the creatures are almost an accessory to one of the main thematic undercurrent of this show, that being the relationship between society and some of its victims. This show, particularly toward the end, raises some very disturbing questions about how society can create its own "monsters" through maintenance of the social status quo and people's self-serving brutality launched against others to justify their own ego issues. That is one of the aspects that is rather engaging about Narutaru, exploring some of the darker sides of the human soul and people's reactions to different kinds of treatment. As I noted before, the character designs are a bit cutesy at times, which seemingly belies the nature of the show. Some of the actions Hoshimaru takes, for instance, seem a bit more surprising and shocking given his basically adorable appearance. The animation is serviceable for the most part, but most of the action scenes seem fluid enough. One of the prevailing moods this show helps generate is that of just general unease. The deliberate overall plot pacing, the subject matter, the scene pacing, and even the music help give a certain creepy vibe that makes the show much more unsettling at times than one would expect. The music is interesting in that it uses a lot of high piano notes, high strings, and the occasional dissonant chord to help highlight the tension. While it isn't something you are going to be rushing out to buy on CD to listen to anytime soon, it certainly does its job of helping the unsettling mood of this show. As I alluded to in the first paragraph, this is not exactly a show for young kids. There are a number of brutal murders, psychological torture, genocidal philosophizing, and a few brief sexual situations. Keep in mind the average age of a character in this show is about thirteen or so as well. Though, I should note interestingly enough that much of this violence is not directly seen, but quite frankly when you see a shadow of a guy's head, and then in the next scene you see that half of that shadow is missing along with an accompanying blood splatter, you get the point. If they actually directly showed all the violence they imply or indirectly show, I imagine there would be no way this could be broadcast on Japanese television. With only thirteen episodes, the show ends without resolving a few of its central mysteries. While normally I would probably be a bit more annoyed at that, it is the characters and their psychologies that made this show engaging (and disturbing) to me, rather than the mysteries behind their unusual companions. Recommended Audience: We have children remorselessly directing brutal murders and terrorist attacks on aircraft along with strange creatures stabbing, poisoning, or otherwise killing people. In later episodes we have several young children as victims as well. Add in some dismemberment, sexual violations, and just a lot of somewhat loathsome philosophy. I would rate this 17+ but since a lot of the violence is more implied or indirectly seen, I am dropping my rating slightly. In any event, I feel that is a show for older teens.